52 Hike Challenge… Will I Finish it? Since Veteran’s Day of 2015 I have been working towards a 52 Hike Challenge. 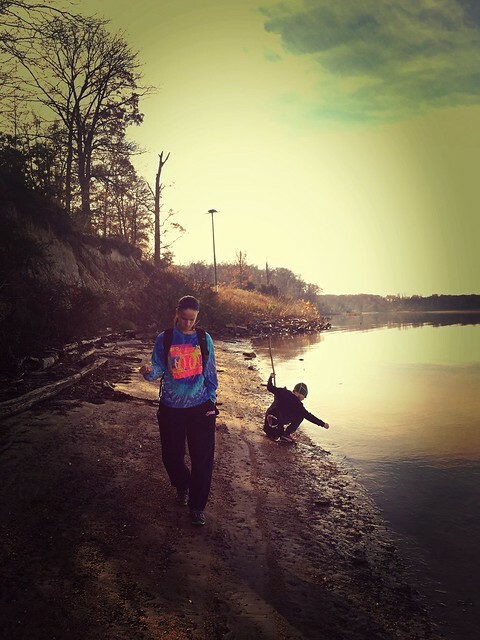 The idea is that you hike once a week to get outside, get some physical activity, enjoy nature, etc. I figured I was outside a lot and loved hiking so this would be a fun challenge. I thought I wouldn’t have any issues completing all 52 hikes. Well…. Here it is the third week of September and I have 11 hikes left. How did this happen? Partially it is because my son’s soccer practices were moved. They used to be at a location where I had access to a variety of trails. It made it easy. Now once a week he is at a very suburban location. There is a trail at the other location but it is very small and not too exciting. I use it for trail running however and trail runs count (I checked). Granted, it isn’t the end of the world if I don’t get all 52 hikes done but I aim to finish what I start. I made a point to get out to a nature preserve that is near me last night. I was happy to have it be just me and the birds at one point. Because we have been in an alm0st-drought I could walk through the brush and stand on the edge of a pond. There isn’t a path out to it so I wasn’t worried about anyone else coming out there. The water had dried up a bit so there was plenty of dry sand. I didn’t sit because of bugs but I was there for quite some time just feeling the peace. I saw a heron, crane, hawk, and probably a turkey vulture fly over me. I heard many other birds and saw a fish jump. A dragonfly flew past me more than once. It was amazing. And that’s why I hike. That’s why I spend time in nature and committed to doing it 52 times this year. I have 9 weeks left to get 11 hikes finished. I think I can do it. I may have to double up on a couple of weekends but I will do it! My last hike will take place on Veteran’s Day – 1 year from when I started (just about). I have a special hike in mind but am weighing my options. And when I reach that summit on my 52nd hike I will rejoice and start all over again. 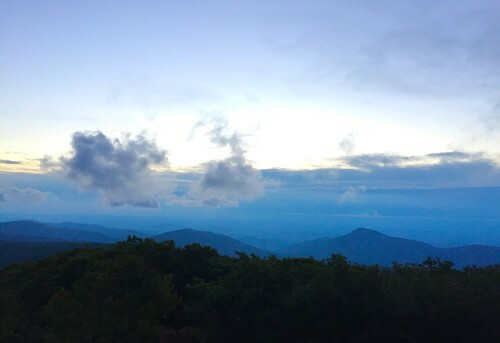 The last time I hiked Hawksbill I had planned to get there before the sunrise. That just wasn’t possible although I had captured the sunrise at an overlook (I don’t know that it turned out very good). 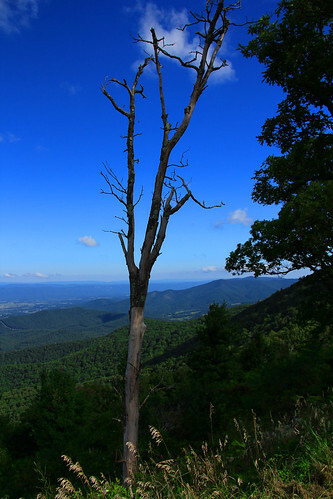 Hawksbill is the highest point in Shenandoah National Park and you get about a 270 degree view at the top. I figured this was perfect. The kids agreed to get up at 3:30 am for the drive out to the park and then the hike. As we arrived at the first visitor/restroom area we realized how windy it was. Hurricane Hermione was off the coast a bit but perhaps the winds were reaching the mountains. We took some time to stop and look up into the sky. My kids had never had the chance to see the sky with so many stars. It was a bit overwhelming. The last time I had seen a sky like that was when I went to Mexico on a work trip in college (many years ago). The sky there was even more magnificent but the kids were appropriately wowed. As we drove down to the trailhead I started to worry that perhaps it was too windy for hiking in the forest area. There were small branches down on the road and the last thing I wanted was to be hiking in the dark and not being able to see branches falling. When we got to the trailhead I left my car lights on and walked out onto the trail a bit to assess the situation. 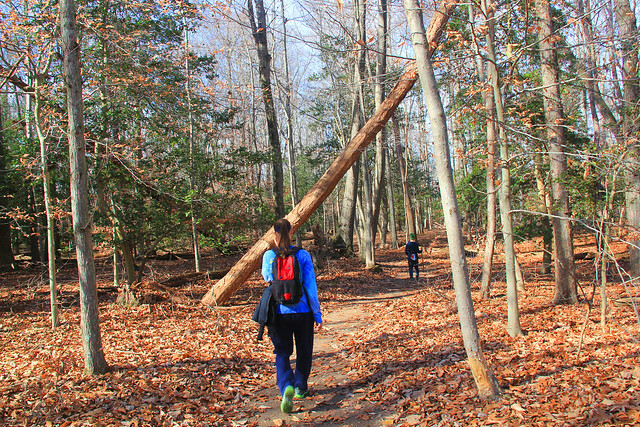 I didn’t see any branches – small or big – along the trail so I decided to make a go of it. 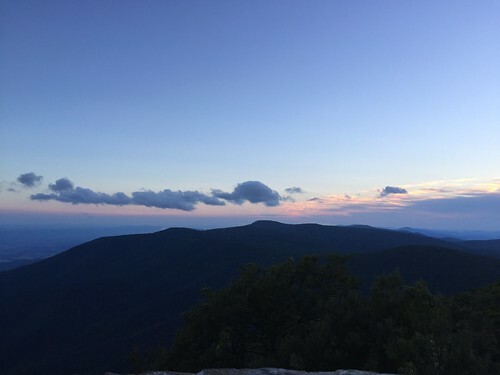 We gathered our packs, flashlights, and headlamps and started up the steep trail to Hawksbill. This was our first time hiking in the dark. It was just about 5:45 am and there was no one else out there. I had my SPOT (GPS locator and SOS device) ready and was prepared with bear spray and my knife. Perhaps overkill but I wasn’t going to let anything happen to my kids. At one point my daughter and I heard something in the distance. To me it had sounded a bit like coyotes but I’m not so sure they hang out in the Shenandoahs. It didn’t really sound like bears either. It freaked her out a bit but she decided it was the wind so we carried on. 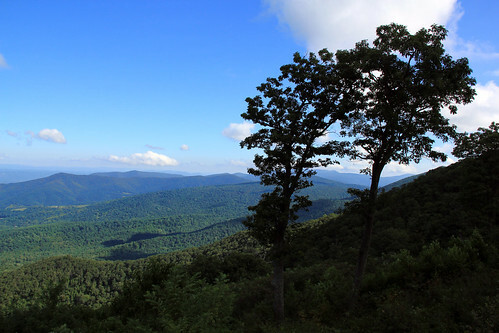 The hike up Hawksbill is not long but it is steep. We had to wait for my son a bit as he started to complain (par for the course with him). We usually grab his hand and help him up the mountain. It didn’t take us long to get to the top. First light allowed us to put away our flashlights. The wind was insane. The gusts were probably upwards of 40-50 mph and it was chilly. Normally, it is fun to scramble around the rocks a bit but I chose caution over risk that morning. One wrong step and you’re down the mountain – having a gust of wind wouldn’t help. So we hung around the look-out area wondering if the sun would come up. I looked out and only saw clouds. I had lugged my tripod up in my backpack and it is a good thing. The lack of light made photos difficult (as I’m just a newbie and have no clue what I’m doing) and the tripod at least helped me get them in focus. My kids huddled down together to stay warm as I roamed around looking for good places for photos. Needless to say I didn’t do great. Eventually, I couldn’t feel my hands anymore. Working the camera was difficult and it didn’t look like the sun would be up for quite a bit of time. The clouds were very high. So we decided to head back down the path. We made it about 10 mins down and the sun decided to appear. I contemplated going back up the mountain again but the looks on my kids’ faces said it all. They were frozen and hungry. 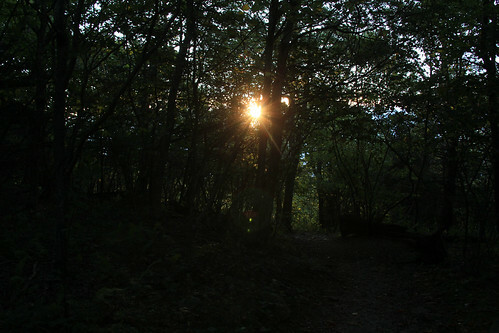 So I took a forest shot of the sun and headed down the path. I wasn’t happy. I was pretty sad and disappointed because it is not easy to get out there for sunrises. We made it back to the car and my son realized he couldn’t find his phone. Alas, he had left it at the restroom we stopped at on the way into the park. Thankfully, it was there and we drove all the way back to get it. All I was hoping was that no one else would visit the restroom and find it before we could get there. Whew. 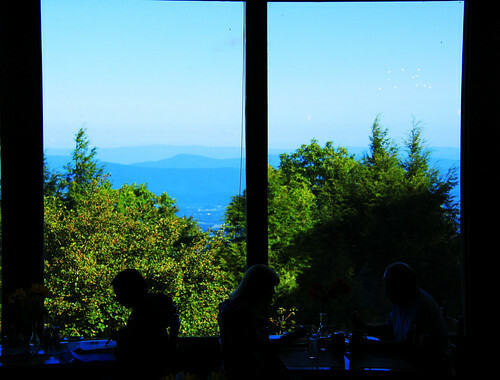 We hopped in the car and returned back on the road to return to Skyland Resort for breakfast. The dining room was beautiful and the food was fantastic. The windows offered great silhouettes although I couldn’t quite get what I wanted with my kids. They played along a couple of times but usually grow tired of me asking them to pose for photos. On the way back we stopped at various overlooks for photos. There are quite a few that didn’t make it into my album. I need to add them because it shows us having fun and goofing around. Finally we reached the road to go home and made the 1.5 hr drive back to the house. All-in-all we had a good time. 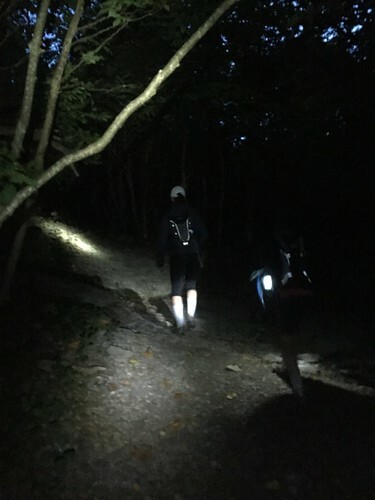 My son loved hiking in the dark while my daughter was freaked out about it. We agreed that we would try again in the future so that we could see the sun actually come up and bless the mountains with its light. My kids and I followed the REI initiative to #OptOutside for Black Friday. 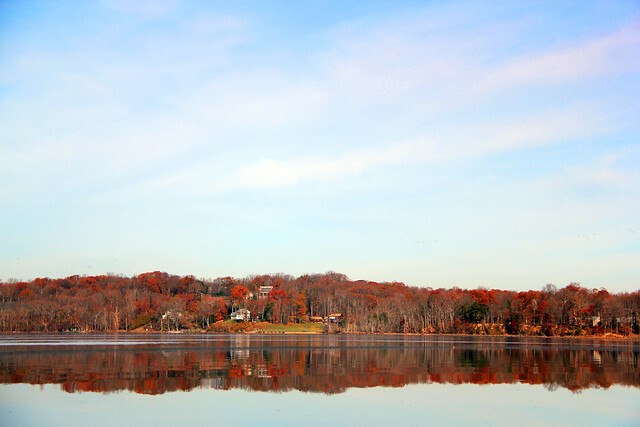 Instead of getting stressed out trying to find parking, waiting in long lines, and risking the chance of getting involved in some ridiculous throw down we headed to Mason Neck State Park in Lorton, Virginia. We were interested in this park for a couple of reasons. First it has a small beach area. This was of particular interest to my son who loves to skip stones. He’s pretty good at it and the smooth water and flat rocks made skipping pretty easy. 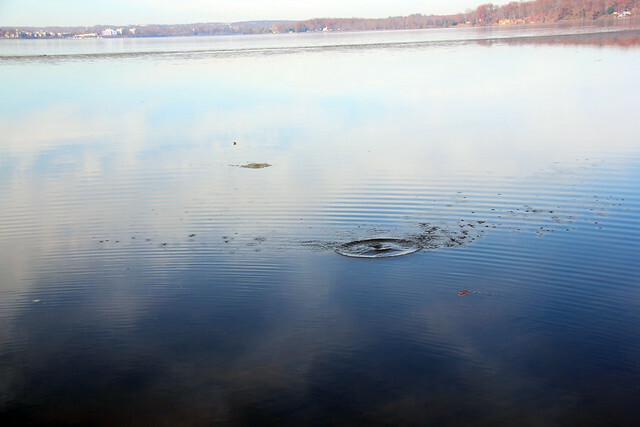 The second reason for hiking Mason Neck State Park was the possibility of scouting eagles. They have three areas where it is possible to see eagles (and other birds) and this excited the kids. We started at the beach. The kids enjoyed finding smooth rocks, shells, and clams. I think we could have spent another 30 mins in that area. It wasn’t big but there was a lot to see and explore. Soon, a couple of families came with young kids who were yelling and screaming so that was our key to leave. As a side note, parents, please teach your children at a young age that screaming and yelling on hiking trails, while fun, can cause a disturbance. I understand kids are going to yell from time to time but I’ve always instructed my kids that we use normal voices or whispers. And often, silence. That’s why we are in nature. From there we headed out to the trails and went straight for the Eagle Spur Trail. This was a nice and easy hike. There is little to no elevation so going the 1.5 miles or so to the bird blind is easy. This is a great trail for families with small kids. When we reached the bird blind there was a large family with a large dog eating lunch in there. They said for us to come on up but that would have been awkward. There wasn’t any space and they looked like they were settled in for awhile. Again – trail rules – find somewhere other than a bird blind to eat. We took the time to scurry down an overgrown trail. 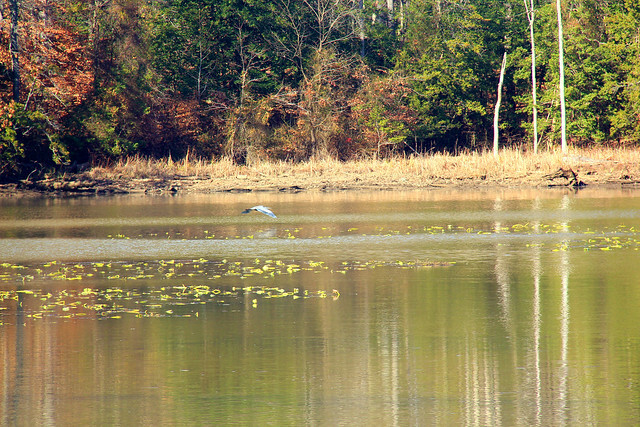 From there I was able to see a Blue Heron take off. Finally, the family left and we were able to sit in the bird blind with a father and his daughter for a good 30+ minutes. We saw the heron, a duck, some seagulls but no eagles. It was really amazing to sit there in silence and hear how the birds came alive. We did eat our lunch there are the father/daughter team left but still maintained a sense of quiet. We headed back and the kids spent some time playing on the playground much to the dismay of some older folks there. I guess they thought my daughter was too old. One is never too old for a playground! 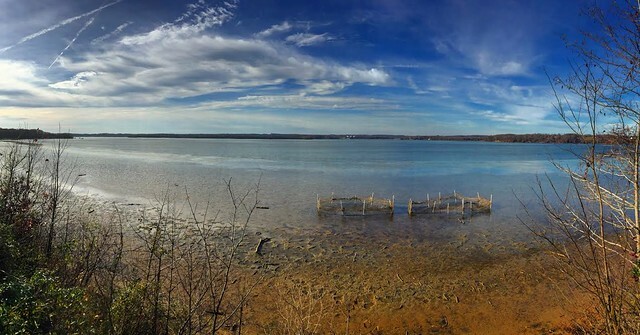 Overall, Mason Neck State Park is really beautiful. I’ll definitely want to come back next fall when the leaves are changing. Also, I’ll be learning about my camera and hopefully will grab better photos. Thank you to REI for promoting the #OptOutside event and closing their stores on Black Friday. It was a big risk for them but I think it has paid off. Click below to see the whole album.